The official video for "Light Me Up", a brand new song from Canadian hard rockers KOBRA AND THE LOTUS, can be seen below. The track is taken from the band's latest album, "Prevail I", which was released on May 12 via Napalm Records. The disc was produced by Jacob Hansen (VOLBEAT, AMARANTHE, EPICA) and mastered by Grammy Award-winning engineer Ted Jensen. Frontwoman Kobra Paige told I'm Music Magazine about the band's decision to work with Hansen this time around: "First of all, I had this feeling in my gut that I wasn't going to be able to find the evolution that I wanted to do inside of North America. I really wanted to try out a new experience with someone who was not North American. I really do think that people in different parts of the world hear music differently. That was an appealing factor to me and I've been hearing VOLBEAT's new record a lot. There was something about the clarity of it and how huge it sounded that really drew me into trying to find out who produced it and it turned out to be Jacob. I really think that on these albums, even if you listen to 'Gotham', there's so much going on there. There's a lot of guitar and a lot of vocal layering, but it is as clear as it can be." Regarding the "Prevail" album title, Kobra said: "The track came after the project was titled and actually the title really set an attitude and precedent for us. It gave us this attitude of pushing forward and not giving up; our bass player, Brad, was the one who came up with the name. If we were really trying to make this very ambitious statement and with everything going on here, then we should call it prevail because that what we're doing. I thought it was perfect and everyone is prevailing through their own story, so it just turned into that." Kobra previously stated about the story of "Prevail I", the band's most ambitious effort to date: "When we are born, we are innocent, pure, and unshaped. This mandala signifies a human at the beginning of its journey. Unscathed and beautiful, the mandala is each and every one of us. As this album unfolds, you will notice it's more than just music. 'Prevail I' is a story of visceral truth and I believe, if we're really being honest with ourselves, everyone will find their story within it. After all, the battles may differ, but we all started as the same mandala and we are more relatable than we'd like to admit. Our only wish is that you may enjoy the freaking crap out of this album and find comfort in realizing you're not alone." 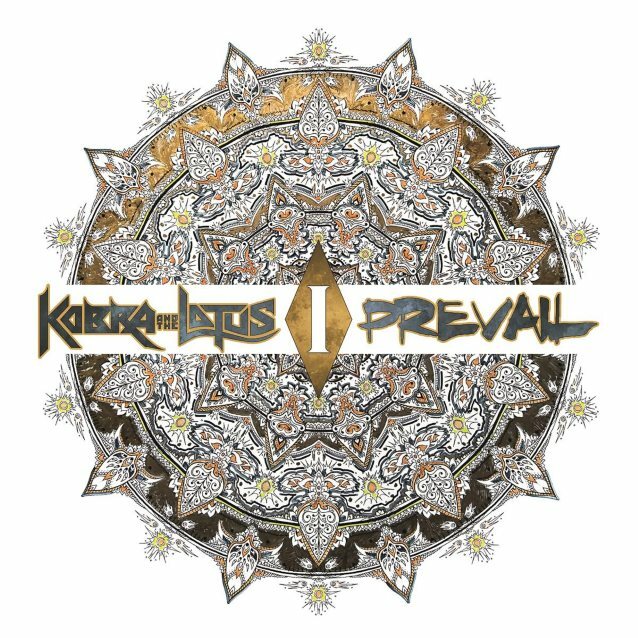 Evolution is inevitable and KOBRA AND THE LOTUS has delivered its most powerful album to date, "Prevail I", with "Prevail II" to complete the story in the not-too-distant future. Led by Kobra Paige, KOBRA AND THE LOTUS has been making a name for itself worldwide since 2010 with extensive touring and three well-received albums. KOBRA AND THE LOTUS is loaded with exquisite precision, heavy emotion, vocal brilliance and grand-scale dynamics, highlighting the glories of classic heavy metal and rock. Known for their exceptionally strong live shows, they proudly carry the flag for all metal/hard rock fans.